Since Bushnell completely revamped their golf rangefinder line, they’ve hit high popularity rates never before seen by the optics company. Their newest model is definitely an improvement on older discontinued models such as the Tour X and the Pro X7. But, what’s so good about it? Let’s check it out! To put it simply, this rangefinder has everything you could ever want in one unit, and we don’t mean that lightly! The X2 gives you the ability to avoid all display issues with varying weather by being able to toggle between an LED and LCD screen whenever you want. This is Bushnell’s Dual Display Technology. Next up is their Slope-Switch Technology. You can have a tournament legal device or a slope measuring unit with a flip of a switch. This process couldn’t be anymore simpler. No longer do you have to deal with tedious face plates and changing them out. It’s a genius feature that’s totally apt for a genius rangefinder. 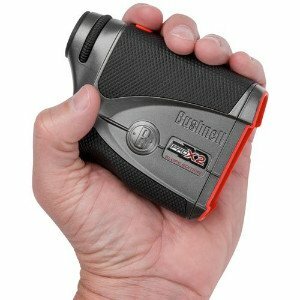 The very well put together rangefinder also keeps Bushnell’s winning technologies such as PinSeeker with JOLT, Stable-Grip, and 2nd Generation E.S.P. We seriously weren’t kidding when we said that this unit has it all! But wait, there’s still more! It’s completely waterproof, the exit pupil is 3.5 mm which is perfect for day-time use, and it’s small and compact. What more could you want now? Does the Pro X2 Lock onto the Flag? Yes, it does! You’ll know the X2 has locked onto your target with the JOLT technology that positively vibrates/pulses in your hand. Why doesn’t the Pro X2 have Mounting Options? While the older line of Bushnell rangefinders did come with mounting ports at the base, the new line has been redesigned to be used effectively as a hand-held device. With the upgraded technologies, there’s no need for steadiness that a tripod or mounting device can offer that the rangefinder can’t do by itself. How Capable is the Bushnell Pro X2 in Acquiring Distances in Varying Weather Conditions? The Pro X2 gives instant readings no matter the weather. 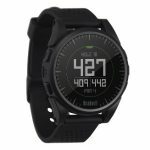 It’s completely waterproof, and it also features Dual Display Technology. If it’s cloudy out, you can use the LED display for brighter readings. If it’s too sunny, the LCD display might be able to help with seeing readings a lot clearer. What is the Stable-Grip Technology? This is the technology that enables you to use the rangefinder easily as a hand-held device without the shakiness that comes with ranging long distances. It ensures you receive an accurate reading fast, like lightning fast! How is this Golf Rangefinder Tournament Legal? When the USGA revamped their policies, it included allowance for rangefinders to use a feature to simply “turn off” or switch off their slope measuring capabilities. Previously, you had to be able to go into your Mode settings to turn it off, and before that, you couldn’t have slope technology anywhere near the course. It’s an honor system, and golfers can’t be reminded enough to play it square or get off the green! 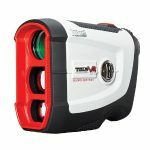 To see more tournament legal rangefinders you can visit this page. What are the Main Differences between the Pro X2 and the other Bushnell Golf Rangefinders? Namely, the Pro X2 has Slope Switch Technology, metal housing, is completely waterproof, and it also has ESP 2 Technology. It’s the best of the best of what Bushnell has to offer. How do you use the Slope-Switch Technology? The switch technology is easily accessible on the side of the rangefinder. Simply switch the Pro X2 logo up with your thumb for slope mode and switch it down for legal mode. Can this Rangefinder be used with Glasses on? The X2 has 16 mm of eye relief, so it should be enough for someone who wears glasses to use it comfortably. Besides, with the easy to read Dual Display Technology, you should be able to see readings clearly enough with or without glasses. To ping up the strokes, the Bushnell Pro X2 can easily be the world’s best golf rangefinder. Bushnell says it is, but do you? With a few rounds of this easy to use unit, we’re sure you’ll be convinced! 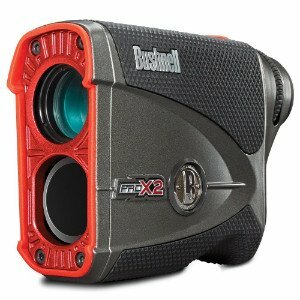 However, if this Pro X2 isn’t quite in your price range just yet, the Bushnell Tour V4 has a better and cheaper price tag. It still maintains a lot of the award-winning features such as Pin Seeker, JOLT, and 1000 yard ranging distance, however, it’s not anything compared to the X2. The new Leupold GX-5i3 is just as loaded as the Pro X2. Competing in the same price range, you’ll be hard-pressed to decide between the two. Since we like both of them, you’ll have to decide which is for you all by yourself. Either way, they’re both champions in their own right! In the end, the Bushnell Pro X2 is a like a golfing dream come true. It leaves little room for error, unless you happen to be “that” bad! Are you pro enough to wield it?